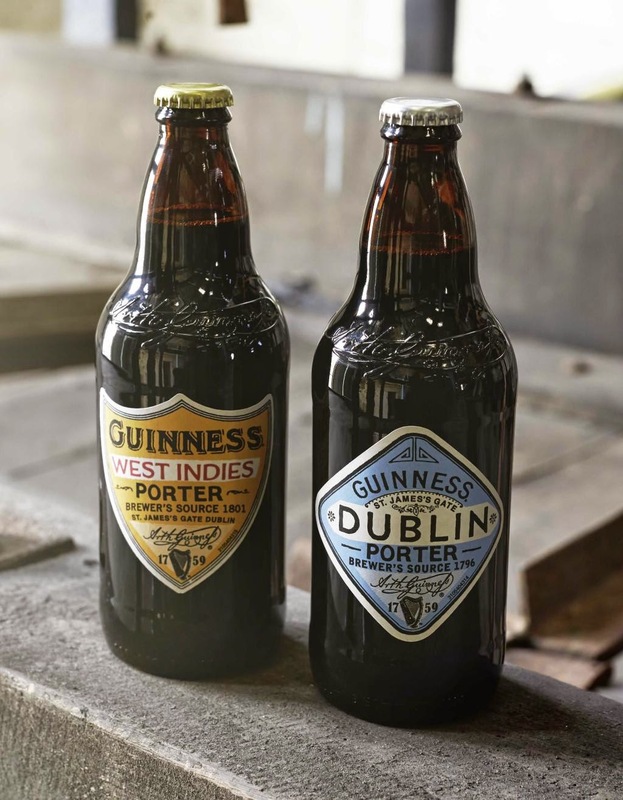 After many months of planning, here we have it: two new Porters from Guinness, both of them “inspired by” historical recipes and aimed, if not at the craft beer bars, then certainly at those pubs and bars who like to carry a varied beer menu. 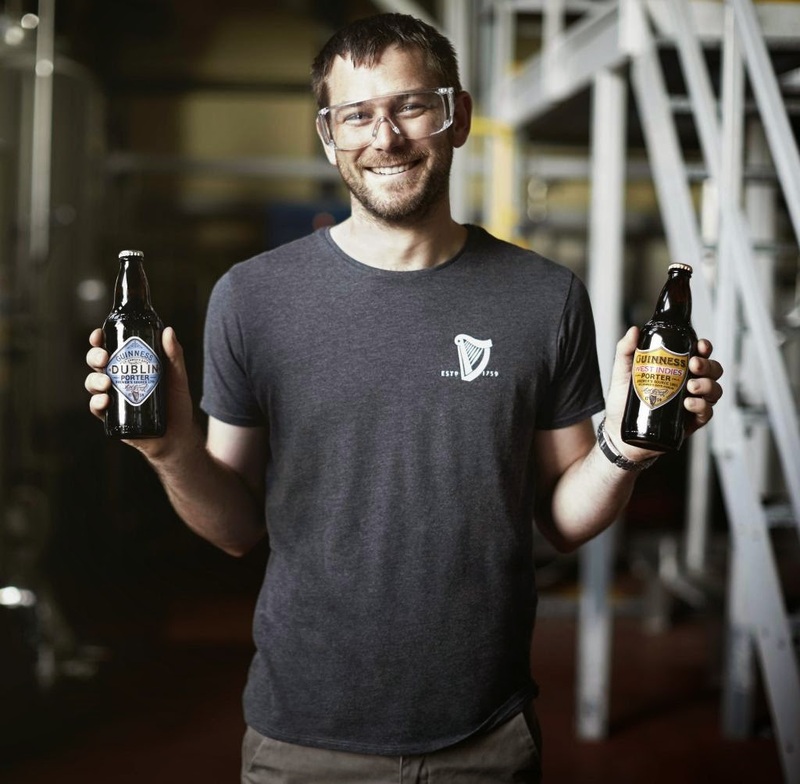 They come from Diageo's relatively new The Brewers Project, set up to enable its brewers “to explore new recipes, reinterpret old ones and collaborate freely”. The first, Guinness Dublin Porter, is a 3.8% dark beer based on a recipe from 1796, which will surprise those who believed that historical beers tended to be stronger than this. "3.5% to 3.8% would have been typical of working men's Porters at that time," explained Guinness archivist Evelyn Roche, adding that Porter strengths started rising from this sub-4% region coming into the 1800s. I found it a pleasant Porter, if a bit watery. There's a touch of coffee on the nose, then caramel, hints of roast chocolate and a light bitterness. It's not so different from the many other Porters at around this strength, including several supermarket own-brands, but of course they don't have the Guinness name on the label. Available in bottles only and at 6%, Guinness West Indies Porter is based on a recipe from 1801 which Evelyn said was the precursor to Foreign Extra Stout. It's dry-bitter with notes of coffee, liquorice, a touch of old leather, and maybe a hint of nuttiness. By comparison, FES is drier, a little more bitter and has sourish notes – the latter deliberately concocted these days, in a special bacterial souring plant within St James's Gate. The Porters are the first commercial fruit from the pilot brewery at St James's Gate. This has both an automated one hectolitre (100 litre) brewkit and a manual 10hl plant similar to what you'd find in many microbreweries. Peter explained that the pilot brewery is used for several things besides developing new beers – brewing the winners of the Diageo annual staff beer-creation competition, testing ingredients for flavour stability, trying out new processes and so on. However, he stressed that they are not specials or one-offs – they are now permanent members of the Guinness range, and have graduated to being brewed several hundred hectolitres at a time in the vast and brand-new Brewhouse no.4 at St James's Gate. So what of the beers? Sure, the tickers and completists will hunt them down, if they haven't been to Morrisons already. For the rest of us, they add a more modern take on Porter – and yes, Guinness is hoping to win another foot of supermarket shelf space in the three-for-a-fiver 'premium beers' rack, where it has only been represented by FES. They are well made and presented – though not bottle-conditioned – and certainly worth trying for anyone who likes dark beers (as I do). As a beer aficionado though, I can't help sensing a missed opportunity. It's fascinating – Guinness is full of wonderfully skilled brewers who are passionate about what they do. They have first-rate gear to work with and massive resources in terms of sourcing ingredients and so on, yet the finished product almost always has an ever so slight feel of dumbed-downness about it. It's as if it gets filtered through the Diageo bureaucracy, and in the process made just a bit safer, just a bit more average. The one exception I can think of is the 8% ABV Guinness Special Export, which as I understand it is produced not to the specifications of Diageo but to those of its Belgian distributor John Martin. There might be a clue there. Still, as one of the Guinness staff said, these are the first two of what they hope will be a bigger range. Perhaps if they see success in the market the Diageo high-ups will relax a little and trust their brewers, allowing future brews to push the envelope a bit more. It is a challenge though – Peter mentioned that his team's been experimenting with barrel-ageing beers, including a Special Export aged in a rum barrel that came out at 13% and was “absolutely delicious!” The problem of course is translating such things to the sort of volumes that Guinness needs to operate at. "Guinness archivist Evelyn Roche said that the original would have been typical of the working men's sub-4% thirst quenchers of the late 1700s. " With respect to Evelyn, the working men would have been drinking beers of about 6% to 6.5%, and they weren't thirst quenchers, they were energy givers. Even servants' small beer would hjave been around 4.5%. "3.5 to 3.8 would have been typical of working men;s Porters at the time" [late 1700s] and "ABVs started rising from 3 point something coming into the 1800s." I asked her almost exactly that question at the time. If I've remembered it rightly (I will dig out my notes) her explanation was that the 1700s beers in her archives were like this, while the 6% figure was more true of the 1800s. Yes, I was sceptical too, but I figured that she's the one with the archives! "Thirst quencher" was my paraphrase, sorry! Nice writeup. I look forward to trying these.